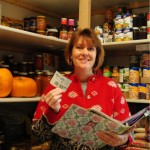 Home | Multiple Categories | Are You Up for the Annual Pantry Challenge? The holidays are over and the New Year is well under way, do you know what that means in the Turner household? It means our annual Pantry Challenge is about to commence! On February 1 we will enter our second year of testing our ability to use what we have and refrain from buying groceries for one month. If you remember from last year, we saved enough money during our Pantry Challenge to buy a new washing machine! Obviously, we were successful in our first attempt at this challenge and are ready to face it again this year. So, are you ready and up for the challenge this year? Many of you followed along as I blogged about it last year, so I’d encourage you to take the step and enter the challenge this year. So, here are the details of what the Pantry Challenge is all about. First of all, everyone can tailor it to their needs. Just because we do it one way doesn’t mean you have to follow the same method. It’s important to personalize your challenge so that you can follow it and be successful. The overall premise is to use the food in your cupboards, in your pantry and in your freezer first before heading to any store to purchase food. In reality, a good majority of us could live off the food we have in our houses for many months but we get into habits and ruts which lead us to spending money each week at the grocery store. Start by taking an inventory of what’s currently in yourpantry. In order to get started on the challenge, I find it helpful to take an inventory of what we have and what food needs to be used up. This helps me form a rough idea of a menu plan and/or forces me to search for recipes using those ingredients. Plus, it also gives me an idea of what I might have to buy during the month. Last year, we had stocked up on super cheap milk and froze lots of gallon jugs so I didn’t have to worry about milk during our challenge. This year we don’t have any milk in the freezer so I know that I’ll be having to hit the store for milk. The goal of the challenge isn’t to starve yourself or eat disgusting food that is old and outdated. Actually, it is quite the opposite. We had some incredible meals last year and it challenged me to be creative with our meals and menu planning. We definitely ate well during February last year and the best part was eating fresh, homemade meals every night. I baked a lot of fresh bread, cakes and pies using fruit we had frozen. If you do the challenge, I think you’ll enjoy all the wonderful food this month. With the savings from last year’s Pantry Challenge, I traded in ol’ Bessie for this big, beautiful washingmachine! We eliminated eating out which obviously always saves a ton of money. Now, our youngest son’s birthday is in February so we did make accommodations for celebrating his big day. That’s why it’s important to set your own rules and guidelines in this challenge. If you don’t modify according to your needs and your lifestyle, then you won’t be successful or you’ll end up creating resentment and will vow to never do another challenge again! Another tip for success is to set a goal. As I mentioned before, we decided to use the money we saved for a new washing machine. Using that visual helped me reach our goal. When I was ready to run to the store for shrimp last year after seeing a to-die-for recipe, I remembered our washing machine and how much I wanted a new one. So, set a goal…use your savings this month for something. Maybe it’s a new appliance or put it in an envelope to use towards a vacation or just put it in savings! The last added benefit of the challenge is what it does to your shelves and freezers. It gives you room which is always a good thing. Now, I have to admit we freeze so many vegetables, fruits and meats that our freezer didn’t look that empty after the challenge. We wanted to make a bigger, visual dent but we were amazed at how things looked close to the same. But the challenge helped us clear out some food that needed to be used before it got too old…it’s a nice feeling to use up that food instead of throwing it out. So, you have this week to prepare and get ready to join the Pantry Challenge! Are you ready? Do you think you can do it? What will you do with all the money you save? C’mon, what do you have to lose? You’ll gain some valuable real estate on your shelves and in your freezer, you’ll consume food that may otherwise end up in the garbage in 3-6 months and, depending on what’s on your shelves, you’ll eat healthier! Oh, and did I mention you’ll save hundreds (yes, hundreds) of dollars? Leave a comment if you’re going to join the Challenge this year! I’d love to know if I have company this month and how everyone is doing during the challenge! During the month of February watch for my weekly blogs about the Challenge and please share your experiences…good and bad!